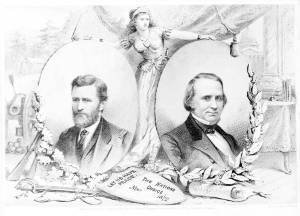 A campaign banner for the 1872 Republican national ticket. The armored figure of Liberty stands between portraits of presidential candidate Ulysses S. Grant and running mate Henry Wilson. Grant's portrait is adorned with oak leaves and Wilson's with olive or laurel branches. On the left are military paraphernalia associated with Grant--rifles, a cannon, and a sword. Beyond is a log cabin. On the right are a writing desk and the Constitution. In the distance is a view of the U.S. Capitol.